The most "fun" gallery in Flagstaff! We are accessible to all tastes and whimsy. Arizona Handmade Gallery has been showing the work of select Arizona artists since the Spring of 2000. Located in Historic Downtown Flagstaff, the gallery has been home to some of the area's best artists over the years. The vision of the gallery has always been to carry art ranging from "fine" to "functional" giving every customer a chance to find something appealing to them. The gallery represents artists of all different media - from glass work to jewelry to paintings to fiber art to mixed media pieces. You'll love the variety you find here! Owners George Averbeck and Holly Gramm are both long time artists - and husband and wife! 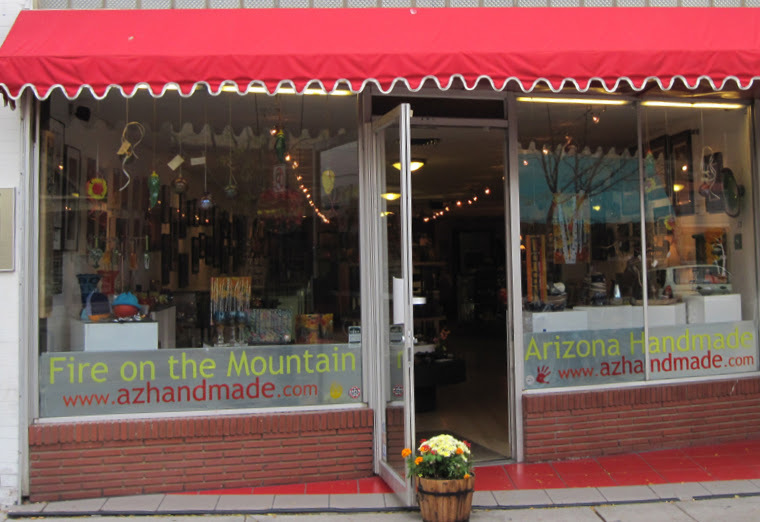 They combined Arizona Handmade Gallery with Fire on the Mountain, turning it into both a showroom for George's blown glass creations as well as an outlet for local artists to display and sell their work. George and Holly can often be found at Fire on the Mountain Studio blowing glass or out and about in the community. If you'd like to meet with them, please call to set up an appointment.